There is a growing interest in ECO-friendly solutions and green living in Sri Lanka at the moment. Many residents in our area have a desire to reduce their waste and contribute to recycling. 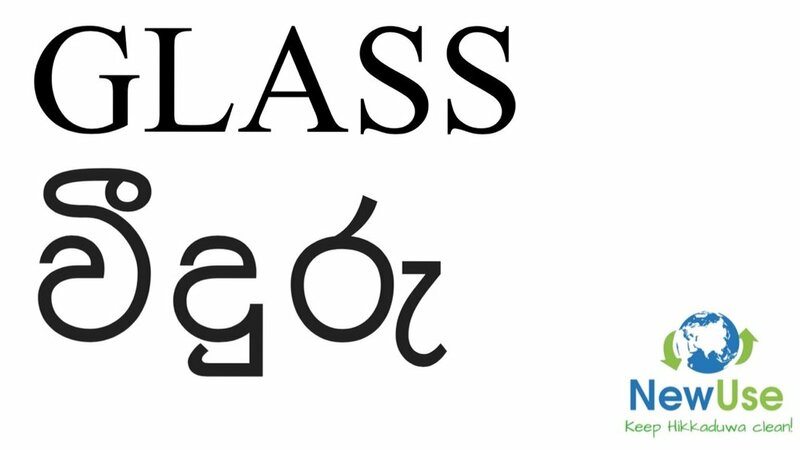 Unfortunately, the information on how to do so, is not easily accessible, especially to people who do not speak and read Sinhala. Photo of Hikkaduwa, Thiranagama. This photo shows the beauty of our beach town, and it is important to keep it clean! The most important things to separate are GLASS, PLASTIC and PAPER. These items are picked up by the normal collection- tractor and they are sold to recycling companies. Giving it away in separated boxes ensures that it is all recycled and does not end up in landfills. 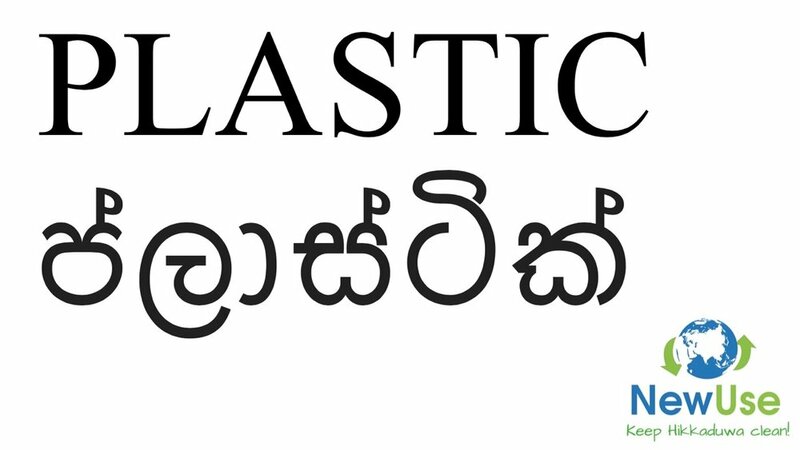 To help you get started, we made these boards with English and Sinhala text so that your family, guests and the garbage-collectors can easily see the different types of waste you are separating. You can print the images below in the size you prefer. Turn food waste into valuable soil! Composting is one of the easiest ways to reduce the amount of waste your family produces. Build your own compost bin or buy a green one shown in the image above from Arpico (4,000 LKR). Put food waste like rice, bread and vegetables in every day. Add leaves, dead flowers and other garden waste every week. After 1-2 months open the hatch and take out the compost. Mix it with soil and use it to plant flowers or grow vegetables. Do not add meat and bones to the compost! Hopefully, after composting food waste and separating plastic, paper and glass, there should not be much waste left. This residual waste will most likely end up in landfills so try to reduce as much as you can. The first, and most important step in this process is of course to BUY LESS! However, from time to time there are things that we need to get rid of. And then it would be nice to give it away to your friends or neighbours. You can also donate clothes, books and other things to the NewUse shop. We are also happy to accept broken/torn clothes and fabrics, as we use the materials to make products. Check out our updated opening hours on our Facebook-page. Suggestions on REUSING and REDUCING will be the subject of another blog post. The Urban Council in Hikkaduwa is responsible for collecting the garbage. As the situation is now (March 2018) it is working out OK in our area, at least much better than many other parts of Sri Lanka. Still it is not perfect, and we are hoping the service will improve. In the main road - Galle Road - garbage is collected every morning except full moon days and public holidays. Pinkanda Road: Tuesdays and Fridays. The situation on other roads in the area is less clear. Please give us input if you have more details. Make sure you put your bins and containers out in the street from 07:00 in the morning to make sure it will be collected. No need to use new, fancy bins (they might be stolen from the street). The paper, plastic and glass bottles can be delivered in open bins. No need to wrap it in plastic. The garbage collectors seperate plastic, paper and glass on the truck. The Urban Council sells plastic, paper and glass to large recycling companies in Colombo. These companies collect from Hikkaduwa once a week. The garbage collection service is free. However, it is common practice for residents to make a small payment to the collectors. If you are living a bit off the main road, a small monthly payment, will help to get the garbage collected (200 LKR). Especially before New Year you should give a small tip. After all, these people are doing a very important job here in Hikkaduwa. BATTERIES can be delivered to the Post Office in Hikkaduwa! Glass bottles (beer, soft drinks etc) can be returned to the shop where you bought them. You will get the deposit you paid back. If you live in the Thalpe, Galle and Unawatuna area, please contact THALPE RECYCLING CENTRE for information on their recycling services. Get more ideas from the Facebook group: Sri Lanka Cleaning and Recycling Program. Step 5: Spread the word and ACT! Reducing your waste and separating garbage ready for recycling are the most important things you can do. What a difference it would make if all households and hotels did the same! So, let´s start the change today. The first step towards change is to create awareness by sharing this information and talking to other people. We are all part of the problem and we must all be part of the solution. Besides separating garbage at home, collect plastic from the beach whenever you visit. Bring it home and give it to to the garbage collectors the following morning. You are also welcome to join our monthly beach clean-up. This is the information we have on recycling in the Hikkaduwa-area right now. In upcoming blog posts, we will share ideas for REDUCING and REUSING. Stay tuned! Let´s help each other to spread the word! NewUse want to do what we can to share information about this subject. Please contribute with information that you have and we will keep this guide updated. Leave your comment to this blog. Please share it with your friends living in Sri Lanka, and ask for input.